Omaha's Best Tasty Burger Restaurants - "I do love the taste of a good burger." 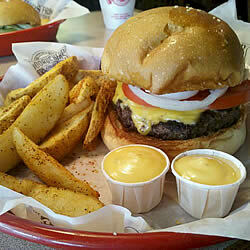 Fuddruckers, the Texas-born World’s Greatest Hamburger destination, has been delivering uncompromised quality and in-your-face freshness for nearly 30 years. They serve only fresh (never frozen) 100% All-American, premium-cut beef, born and bred for taste on a handful of ranches in the United States. Fuddruckers 1/3, 1/2, 2/3 and 1 pound burgers are grilled to order and placed on a scratch-baked sesame-seed topped bun made fresh daily, ready for guests to pile it high at their free produce bar. Cheeseburger in Paradise is your friendly neighborhood beach party! Their famous Cheeseburgers and Caribbean dishes are always hot and the Umbrella drinks from their Tiki Bar are always icy cold. They'll put you in a tropical state of mind in no time at all. Five Guys Burgers and Fries is a very successful chain, worth a try. Their burgers are 100 percent fresh beef, made fresh just for you. You also get a huge bag of homemade fries. 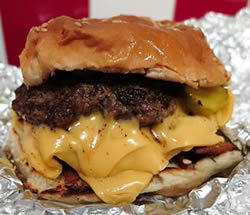 "At Five Guys, its more than just, "burgers and fries." It's a whole new approach to food. There are over 250,000 possible ways to order a burger at Five Guys. They have no freezers in Five Guys locations, just coolers. Nothing is ever frozen, and they use only Peanut oil. 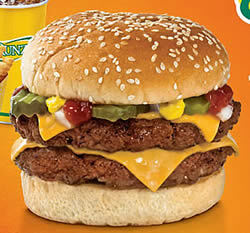 The Runza "Legendary" double cheeseburger is one of the tastiest burgers in Omaha. 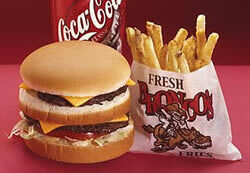 Fresh, never frozen, 100% ground beef burgers made to order and topped just the way you like. Louie M's Burger Lust Cafe is a well-known neighborhood "joint" famous for tasty burgers. They have 19 different variations of individually made hamburgers. "It's like a candy store for meat lovers." Try the Ultimate Burger. It features hash browns, Jalapeños, ham, a fried egg , American cheese and topped with hollandaise sauce. Stella's "World Famous" cheeseburgers and down-to-earth friendliness continue to set them apart from a state full of burger joints. Remember those fresh, generous and messy burgers the little old cafe in everyone's home town used to make? Stella's still makes them. The burgers are good and, well, greasy, and that's part of what makes them good, and so real. The burgers are served on paper napkins with freshly cut "Stella Fries." a bun, and an order of fries! 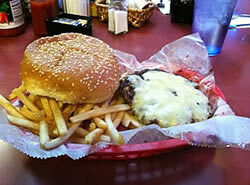 Dinker's Bar is the home of, "Omaha's Best Burger." Located just off the I-80 Martha Street Exit, Dinker's is nestled in the heart of one of Omaha's oldest neighborhoods. They've been serving up Omaha's Best Burger for over 60 years. Their extensive menu features a variety of Original burgers, homemade daily lunch specials and American classics. The King Kong Restaurant is a family run operation that thrives on a reputation for big portions and small prices. They are the equivalent of a Greek fast food restaurant, and the menu board includes gyros and Greek salads. 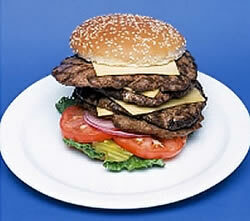 If you're really hungry, try to tackle the 2 pound Super Kong, a four patty tasty cheeseburger. 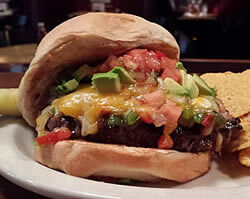 Thick, juicy burgers are the specialty at Goldbergs, an Omaha favorite. You can choose from the menu or make up a burger on your own. You may want to try the other house specialty, a perfectly mixed Bloody Mary. 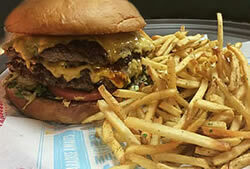 The Sinful Burger Sports Grill in Bellevue makes a variety of tasty 1/2 pound burgers, a different one for every sin. 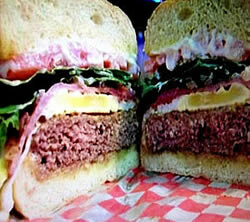 The Gluttony Burger (The most famous sin of all) includes 2 Sinful Burger patties stacked with bacon and cheese. They are topped with 2 grilled cheese sandwiches as buns. The total weight is well over a pound. Cooked medium – juicy Lucy style, and will have some pink. They feature the Goliath challenge. You have an hour to eat (and keep down) a total of 5 pounds of food. The burger is around 4 pounds +/- and the fries make up the balance. If you win you will also get one of their Sinful Tee’s In the event you lose you pay $25.oo for the Goliath burger and fries, and they get to take a pic of you holding the unfinished food. The Nite Owl makes a tasty burger. They offer daily specials. This one is called The Champ Kind: Wagyu Patty, Guryere, Roasted Brussel Sprouts, Bearnaise, House Steak Sauce and Shoestring Potatoes! 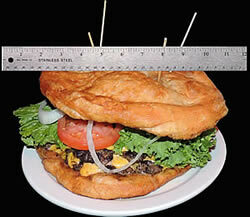 Omaha is the only place on earth to get a Big Bronco Burger. In spite of all the high-tech advances in fast-food preparation, Bronco's still makes their own french fries daily from fresh, whole potatoes, and use fresh, not frozen, 100% ground beef. 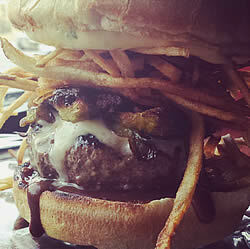 The Twisted Cork Burger was rated the #1 burger in Nebraska by The Food Network.. 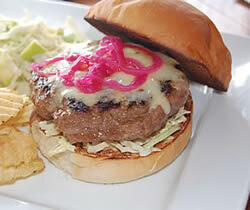 This house made and hand pressed burger is made from Nebraska grazed beef with spices & pork. It comes with Dead Guy mustard, Whidbey slaw, Tillamook white cheddar, pickled red onion, Le Quartier bun, kettle chips and Apple-Bleu slaw. Block 16 is a locally-owned restaurant that’s hell-bent on creating fresh, fun, street-style food. They source your meals from local, humanely-raised and preservative-free ingredients. Their Block 16 burger is a tasty 1/4 lb. patty with Swiss Cheese and all the fixins’, but they also create some wonderful daily specials. 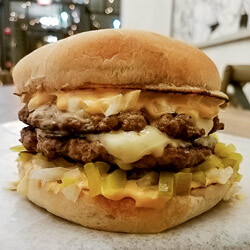 Pictured is their Loaded Mushroom Burger, consisting of a house patty, cippolini-mushroom ragu, funky brick cheese whiz, pickles and sauce on a sesame bun. Check their Facebook page for their daily special.